My last morning skincare routine was over a year ago, so I thought I’d refresh it and tell you all the products I currently use. My cleanser of choice is of course my all time favourite, the Dermalogica Special Cleansing Gel, which in case you didn’t already know, or read on my blog 98452 times, is the only cleanser I use. It’s gentle, clearing and all I require it to be. The second step in my morning routine used to be the La Roche-Posay Serozinc toner however I’m currently not using it as I’m on a prescribed solution for my acne and didn’t want to to be using too many products with similar ingredients. So instead I go straight in with the Kiehl’s Daily Reviving Concentrate. I take about 4-5 drops warm up the product with my finger tips before gently pressing it into my skin. Not only does patting product into your skin allow to absorb it more, but I always find that trying to rub an oil into your skin leaves a weird film on your skin, as well as it can irritate my skin. I tend to try a few eye creams, but currently I’m using the Clinique All About Eyes. I do like it, but I’m interested in trying the richer version to see how that differs. I’ve recently noticed that my eyes can get quite dehydrated, so having a good hydrating eye cream is key to make me look awake and makes concealer go on a lot better. Of course I could not forget to mention a long time favourite the La Roche-Posay Effaclar Duo+. You can read my full review I wrote in a previous post here, but in short I love this as an in-between a serum and moisturiser. In the mornings I use this after the Kiehl’s oil and before my moisturiser. I’ve been loving the new-(ish) Neutrogena Hydro Boost Water Gel that was released last year. There’s two versions of this: the water gel (which I use) is designed for combination/oily skin types, but they also have the ‘gel cream’ which is richer and for those of you with a dry/normal skin type. 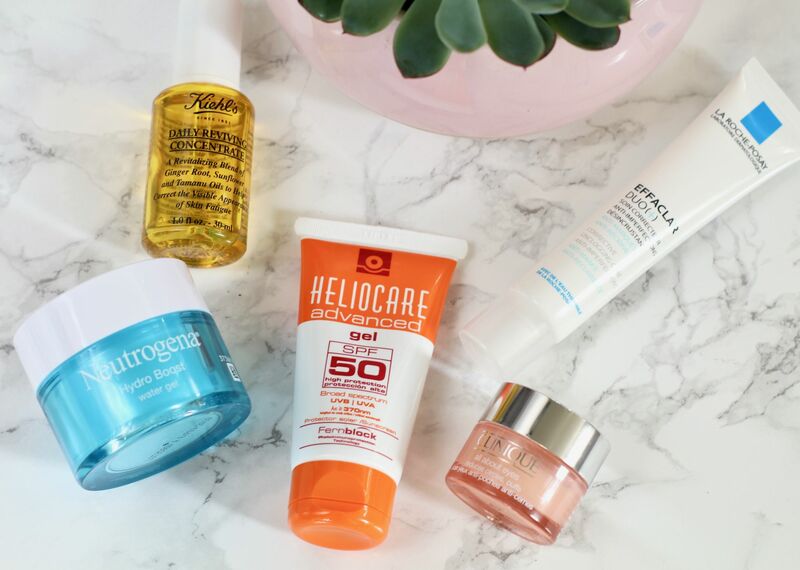 The water gel is light weight, yet very hydrating, without making my skin an oily mess – definitely one to try if you haven’t already! And lastly, the most important step: sun cream. A few months ago I decided to try a new sun cream designed for oily and acne prone skin that’s also non-comedogenic. 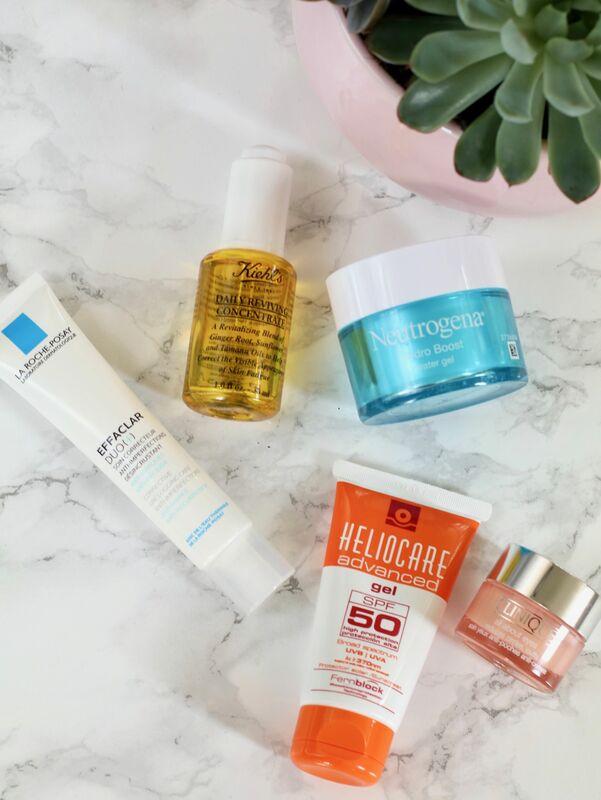 The Heliocare Advanced SPF 50 Gel is one I picked up after reading Caroline Hirons blog and is a lovely sun cream, although a little on the pricy side in comparison to other suncreams of the same size. Having used it for 3 months now I can safely say it works for my skin, and due to the slight tint it does not give the usual white effect. What products do you swear by in the morning? *Some links are affiliate links.